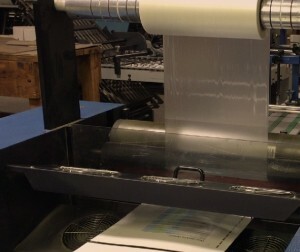 Laminating Services - Steve's Bindery Service, Inc.
Lamination preserves printed pieces for years by acting as a barrier against dirt, spills and other damage. The glossy finish adds a superior look to the finished product. Laminating services should be considered for paper materials that will be repeatedly handled, stored in high traffic areas or displayed. At Steve’s Bindery Service, Inc., we offer layflat films in 2-sided lamination with borders or with flush cut. Our film laminate service is available in 1 1/2, 3, 5, or 10 ml thicknesses. The thicker the laminate film, the longer your printed materials will last. Our laminating equipment, the D & K Double Kote Junior, provides two-sided lamination capabilities and includes a sheet feeder, cutter, laminator and jogger box. It offers a versatile laminating width of 26”, and the revolutionary NT roller holds the temperature at +/- 300 degrees Fahrenheit. It offers the ability to run 10 ml films up to 25 films per hour. The minimum sheet size is 5 1/2″ x 8 1/2” and the maximum sheet size is 25” x 30”. Minimum sheet thickness is 80 lb. text and the maximum sheet thickness is 20 pt. board. At Steve’s Bindery Service, Inc., each piece of equipment in our 16,000 square foot facility is maintained regularly to limit downtime due to jams, malfunctions or repairs. This allows us to adhere to our customers’ schedules and provide a high quality product. The facility is kept clean and organized, and any materials arriving are stored to keep them in pristine condition. It is through this attention to detail and professionalism that Steve’s Bindery Service, Inc. is able to produce the flawless finished products our customers’ require.